Parents often begin to worry when their children are diagnosed with Molluscum contagiosum, which is caused by a virus and often looks like a series of small warts. A stigma is sometimes attached to this skin condition, which is incredibly common in children, because of its wart-like appearance. Like warts, molluscum can take months, and occasionally years, to disappear on their own. And like warts, this condition can put people off – especially nervous parents - as it is contagious and can be unsightly. But if your child is diagnosed with molluscum, don’t worry. 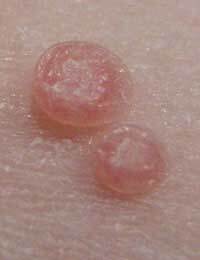 Most children only experience a handful of these small, red blisters on their skin, and usually they clear up within a few months. The most important thing to keep in mind is that even if they take longer to go away, they are completely harmless. Molluscum contagiosum is very common in children aged 10 and under, and so is known as a childhood skin condition. Molluscum, which are caused by a pox and not a wart virus, are contagious and spread by simple skin contact, although they can also be passed on by contaminated towels, flannels etc. Adults have an immune system that is more sophisticated, so they are almost always immune to catching them. The exception is genital molluscum, which is a sexually-transmitted infection. Molluscum in children appear as small, skin-coloured bumps, which eventually fill with fluid, turn red and then dry up and disappear. Most children only get a handful of them, and children between the ages of one and four are the most likely to develop them in the first place. Most GPs in this country leave molluscum alone, allowing them to go away by themselves. Some GPS, however, take a more aggressive stance, choosing to freeze off individual molluscum with liquid nitrogen, which can be traumatic and painful for young children. Burning them off can lead to scarring, so keep in mind that scarring is incredibly rare if molluscum are left to disappear on their own. In some countries, paediatricians apply a medication called Cantherone, which is made from the juice of beetles. It is applied topically directly onto the molluscum, causing a blister to form. Eventually the blister will pop and the molluscum will dry up and disappear. Some people prefer to squeeze molluscum to make them go away faster. You can ask your GP to do this, or do it yourself. If you choose the latter, make sure you wear disposable gloves and wipe up the contents of the pustules carefully. It is easiest to squeeze them when they are at their softest, i.e., after bath time. Molluscum may initially appear to be chicken pox, but unlike the pox these tiny blisters are not itchy or irritating. Apart from being visible, they are hardly noticeable at all. Most children only get a handful of molluscum. If your child gets more than 100, it may be a sign that he or she has an underlying immune system problem, and you should see your doctor. Molluscum are contagious, but it is actually hard to catch them. There is no need to keep children away from school, swimming or other activities if they have this virus. Most children become immune to the virus after experiencing one episode, and therefore repeat episodes are rare. It is thought that children who have atopic eczema are more prone to catch molluscum contagiosum than children who don’t have eczema. If you believe your child has molluscum contagiosum, see your GP for the correct diagnosis. If you child has more than 100 molluscum, ask your doctor about treatment and also to check if this is a sign of a more serious underlying condition affecting the immune system. In most cases, the GP will decide to let the infection clear up on its own. Remember, the rash can persist on average from 12 to 18 months, but in most children the condition will be extremely mild and hardly noticeable at all. @woopwoop034 - it sounds like it could be chicken pox. Your mum would have to take you to the docs to find out. I'm sure your mum would remember if you have had chicken pox before. You don't really forget! My younger sister just got rid of her chicken pox and she is 3 years old. I am however 12 and my mum isn't sure if I've had chicken pox before. But yesterday I was sent home from school after feeling very warm but cold with shivers and felt dizzy and my neck felt heavy and stiff. I am off school today due to the same symptoms and have a loss of appetite. I had several itchy red marks and couldn't help but itch them and they ended up turning into what looks like warts. Is this chickenpox or something more serious.